For years I have noticed that the NY Times has the very worst education reporting in the city. I often disagree with the editorials in the News and the Post, but their reporting often contradicts what appears on their op-ed pages. Sometimes I wonder whether the editorial writers read their own reporting. Since Times reporting is so frequently timid and wishy-washy, I guess their editorial writers follow it, except the great piece that exposed the Moskowitz Academies. Their piece today is utter nonsense of the same variety put forth by Nicholas Kristof, who bemoaned the fact that Merryl Streep and Colin Powell were unqualified to teach in public schools. The fact that they had never expressed to remotest desire to do that, let alone take the spectacular pay cut that would accompany that decision, never entered his mind. If it did, it certainly never entered his column. The Times criticizes teacher training programs. I will admit that I took some crappy and useless courses when getting my Master's. But I also took great courses in my subject area, courses that gave me a very good understanding of language acquisition, bilingualism, and the structure of the English language. We all kind of implicity understand its structure but never really have to think about it. New York’s high-performing charter schools have long complained that rules requiring them to hire state-certified teachers make it difficult to find high-quality applicants in high-demand specialties like math, science and special education. They tell of sorting through hundreds of candidates to fill a few positions, only to find that the strongest candidates have no interest in working in the low-income communities where charters are typically located. Curiously, it's escaped the Times' notice that public school teachers work in every single one of those communities without exception. And if we take this paragraph at face value, it clearly states that the strongest candidates have no desire to teach at these charters. Why is that? Is it because of the neighborhoods they're in? Or could it possibly be that they don't wish to work under substandard conditions in Moskowitz test-prep factories? Maybe they don't feel like giving scripted lessons and wish to develop their own teacher voice. The new rules will allow charter schools that receive SUNY approval to recruit people who have college degrees in areas other than education as well as 3.0 averages for training programs that consist of a month of instruction and a week of practice teaching. Exceptions could be made for musicians or other artists who lack degrees but have been widely recognized in their fields. In its general outlines, the training regime resembles the highly successful Teaching Fellows program, under which New York City recruits college graduates and people who are changing careers to work in schools serving low-income children. Except for the fact that Teaching Fellows eventually needed to get Master's degrees and meet state standards for certification. Oopzie. Well, the Times doesn't always vet its sources all that closely. Maybe the Times editorial writers followed a similar program. 30 days of reading newspapers, a month writing a few things, and who cares if your ideas are fundamentally unsound? 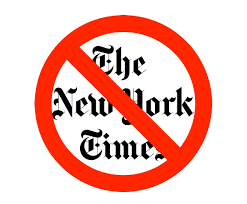 Hey, let's stop wasting time with all that medical school, buy a few stethescopes, and let the Doctor Fellows work on NY Times editorial writers. And if it doesn't work out, the Times can always hire a Lawyer Fellow to mess around with a lawsuit. Are lawsuits two-piece or three-piece suits? Who cares? The important thing is giving them a chance.